I remember when they my kids were toddlers and our Christmas tree was surrounded my bright, colorful toys on Christmas morning. Now, my kids are getting older and they're starting to grow out of the toy phase. Much of their Christmas wish list consists of sports stuff and electronics. My little guy is going loving Skylanders at the moment, and my older son is desperately wanting FIFA 14 so he can get his soccer fix! Best Buy is unique because they feature more than 100 products sold only at their stores this holiday season. They offer a market-leading selection of the hottest tablets, smartphones, gaming consoles, health and fitness gear, and much more. Buying things online is convenient, but I also like that I can go into the store to check out the products in person. I like the option of asking one of Best Buy's trained staff members for help if I need it. These tech items can be expensive, so I'm always checking my email for deals from Best Buy. They understand that price is important to their customers and it’s important to them too. Their Low Price Guarantee helps to ensure that we’re getting the most competitive price possible. 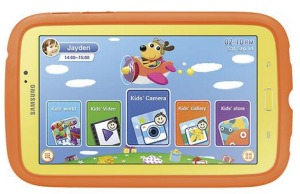 How cool is this Samsung Galaxy Tab for Kids? I love the bright colors and the fact that it includes a bumper guard to protect it from those inevitable drops and bumps. I wasn't sure about Skylanders when I first heard about it, but I can totally see why kids love it. My son would be over-the-moon if he saw Skylanders Swap-Force under the Christmas tree. Even Barbie is tech savvy now! Let your child transform an Apple iPad into a makeup mirror with this Barbie Y2748 digital makeover kit. LOOKING FOR A PROMO CODE OR COUPON CODE FOR BEST BUY?